As you know from my Super Bowl 50 post, I spent the majority of Super Bowl weekend down at my Dad’s house in the town I grew up in. I always love going home and I’m down there frequently for events such as birthday dinners, wedding/baby showers, girl’s night with my high school friends or to simply take my Memere to lunch. However, on Super Bowl Sunday morning, I found myself with nothing to do until kick-off. At first, I felt a pang of loneliness. But I didn’t want to go down that road and I caught myself before I did. It’s times like this that force me to face the fact that I am, indeed, alone. Not in the sense that I have nobody to turn to and I am some sort-of abandoned person without friends or family who care about me. Actually, it’s quite the opposite! But the following is true: I do not currently have a significant other to consult before making plans for the day. I don’t own a pet nor have I yet birthed a child that requires me to plan ahead and put their needs before my own. Therefore, the only person I have to worry about is myself. Upon recognizing this freedom (a freedom that I know some of my friends would kill for! ), I decided to embrace it. “I have nothing to do.” And I got excited! First off, I decided I would indulge myself in a ‘Chippi’ from Mirasol’s – the funky, line-out-the-door-no-matter-what-time-of-day-you-go coffee shop. Despite the fact that its caloric value might resemble that of an entire meal, it is soooo worth it as a treat when I’m in town! Next, I had been long over due for a new pair of clogs for work. So, I ventured up the road to Harve’s Shoe Box – the very same shoe store my parent’s took me to get my first pair of shoes when I was a child. While I love Target and amazon.com as much as the next person, one of the things I love about being home is being able to support the small, local businesses. I also appreciate seeing a familiar face. For anyone who has lost a loved one, you know that some days it’s very easy to talk about it and other days it’s as fresh as the day you lost them. Naturally, that Sunday was one of those immediate-tears-in-the-eyes kind of days and Mrs. B’s face dropped. “I’m so sorry, I didn’t know.” I apologized for getting all choked up and with a big hug, she said, “It’s ok. I lost my dad and some days it just hits you harder than others.” I was able to quickly compose myself and again, said goodbye. But not without feeling incredibly thankful for that hug. A hug from another mother. A mother who just so happened to know my mother. From the prime of her mothering days. I couldn’t have gotten that anywhere else. And this is why I love coming home. After a couple of heartfelt life discussions over cocktails, my heart felt better and I was ready to head back to my dad’s just in time for kick-off. I decided to take the scenic route back and enjoy all that my little hometown has to offer. It’s true that I don’t know how much longer it will just be me. But right now, being single without children certainly has it’s perks. On that Sunday, I became a little more o.k. with it. And I owe it all to my beloved hometown. Monday was the official start to the Chinese/Lunar New Year! I was informed of this by my Vietnamese nail tech, Tina (yes, she falls into the stereotype & yes, she is unapologetically fabulous) when I visited for a manicure on Saturday. When asked about her plans, Tina indulged me. Since the holiday officially fell on the Monday and she would be working, her and her family were planning on celebrating with dinner on Sunday evening instead. Despite our cultural differences, as a nurse, shuffling holiday plans around due to work schedules was something I could totally relate to. I sympathized with her and wished her a “Happy New Year” on my way out, hoping that this was the appropriate thing to do. Prior to the start of the New Year, families clean their homes in order to get rid of bad fortune from the prior year and welcome in good luck. But brooms and dust pans need to be put away before the start of the celebrations so that any incoming good luck cannot be swept away. Unlike our New Year, the Chinese New Year isn’t just celebrated on the Eve/Day of the new lunar calendar year. It is actually a festival lasting fifteen days with each day having a different significance and ritual. The dinner that Tina referred to celebrating on Sunday night with her family is the biggest event of the Chinese New Year. It’s referred to as the ‘reunion dinner’ and is comparable to Thanksgiving dinner here in the U.S. The meal traditionally includes dumplings, chicken and pork. Rather than exchanging gifts, red envelopes are often exchanged between established married couples to younger non-married members of the family and children. More specifically, an even amount of money is usually given as odd amounts of money are associated with money that is given at funerals. Even more specifically, the number 8 is thought to be very lucky because it is the homophone for “wealth”. Therefore, $8 is a common amount of money to be exchanged, although amounts can range from a few dollars to several hundred. The Chinese New Year is usually rung in with fireworks and firecrackers with the idea being that the loud noises will scare away evil spirits and allow the New Year to begin without any misfortune. For me, the most familiar aspect of the Chinese New Year is that for years growing up I heard it promoted on American news programs and announced as “the Year of the <insert animal here>”. Different from the the western zodiac signs where each of the 12 months of the year are assigned a different symbol (ex. Leo, Cancer, Scorpio, etc. ), the Chinese zodiac assigns one animal (ex. ox, rabbit, dragon, etc.) to each year and rotates those animals every 12 years. Personally, I’m not big into the zodiac signs. But I know my sign and I check my horoscope pretty regularly so was super curious and found it quite fun to read about. That is until…I realized I was born in the Year of the Rat. Ew, gross. Why couldn’t I have been born in the Year of the Dog? I love dogs! Or the Year of the Dragon? That’s fierce! Alright, truth be told, I’m still really interested, but I’m not super pumped to share my ‘Year of the Rat’ information on my match.com profile…even if the characteristics (kind, smart and lovely) do suit me. Whether or not you give a s*** about this kind of stuff, have a little fun and check out your sign here to see if you were born in a year associated with an animal you can relate to! 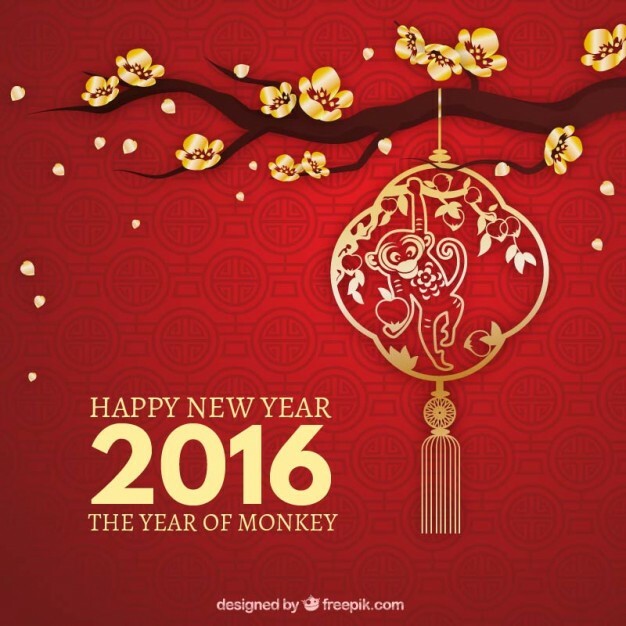 Regardless, let’s welcome 2016: the Year of the Monkey! If you know you’ll be welcoming a child this year (and if not, I suggest you reassess because the monkey is a pretty cool sign and you’ll have to wait anther 12 years for it to come around again!) you might be excited to know that they could have Monkey-esque qualities that include: being intelligent, witty, curious and playful. If I’ve peaked your interest and you want to read more about the Year of the Monkey as it pertains to your personal Chinese zodiac sign, I highly recommend this site. Ultimately, I am a huge fan of the many traditions my family and I maintain every year. And after learning a little bit more about it, I now have so much more respect for the traditions associated with the Chinese New Year (p.s. I also learned that it’s perfectly normal to wish someone “Happy New Year”). Take home point: I’m 100%, all-for promoting a tradition that welcomes wealth, prosperity and good fortune. Or one that gives us a fun way to introduce our single friends to random strangers: “Hey, did you know Jackie was born in the Year of the Rat?” I can’t wait to hear that one. A couple of weeks ago my dad and stepmother travelled to Florida for their yearly vacation. Coincidentally, my brother and his girlfriend (who lives fairly close to my dad) were also traveling to Costa Rica for the week. 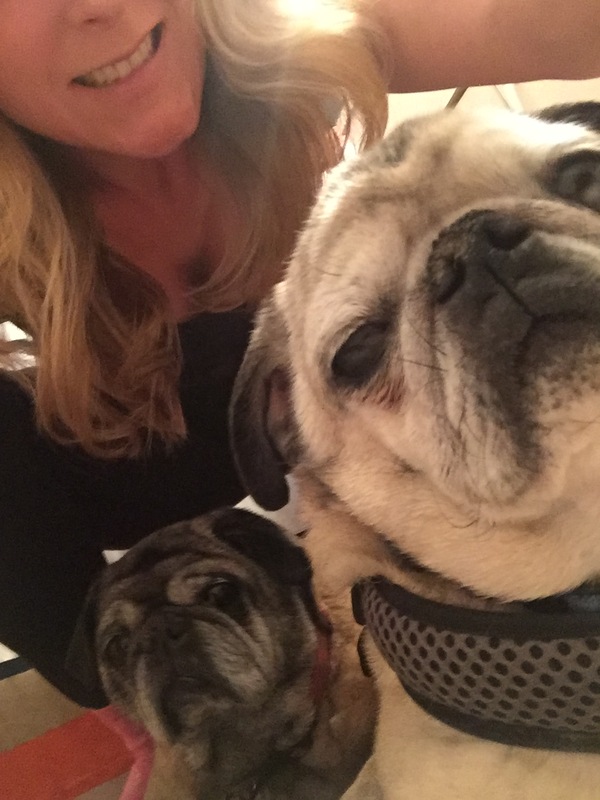 So, that left me as the next, most qualified person to watch their two high-maintenance, geriatric pugs – Bubba and Missy. Bubba and Missy are two of the most lovable, docile creatures you have ever met. They have been to my apartment in the city for a week once before. However, they were much younger, less blind and way more spry. I was also living with someone at the time, so there was an extra pair of hands on deck. Because I love them so much, nobody had to twist my arm to watch them, but I knew this time was going to be a lot more work and a lot more accommodation. So I took a week of vacation time and prepared for their drop-off on Saturday morning. Once my dad left, they looked up at me with the most pathetic little faces. And they were for sure, all sorts of mixed up. However, they know me very well so it didn’t take long (about 1 hour) for them to settle in and get comfortable enough to urinate on my bedskirt. Perfect. I was beginning to wonder how the hell I was going to do this all week. 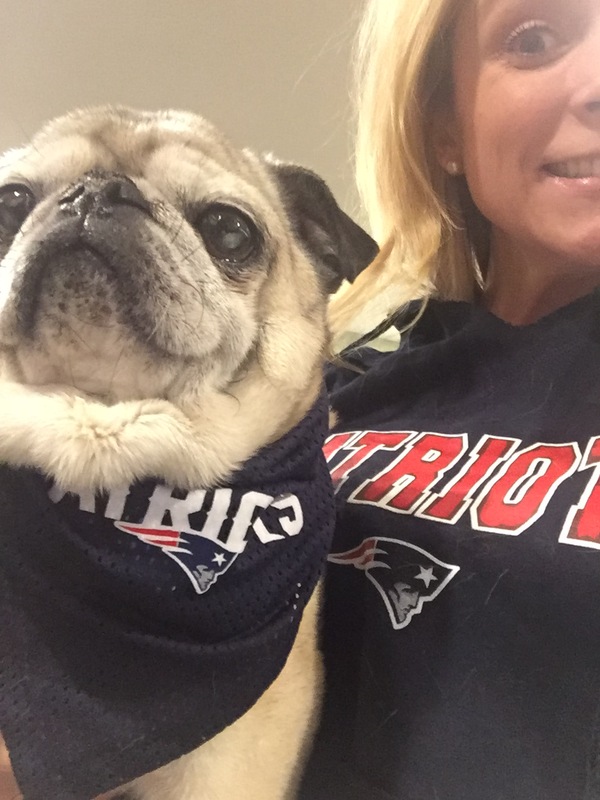 Our first adventure was to head to my friend Julie’s house to watch the New England Patriots playoff game. She had invited me over earlier in the week but I explained I would have not one, but two, four-legged friends in tow. “Why don’t you just bring them? They are pretty low key, right?” Low key? They are thirteen years old. All they know is low key. So I bought my low key friends a couple of Patriots bandanas, packed them up in the car and off we went. The Pats won but Bubba was particularly unimpressed. 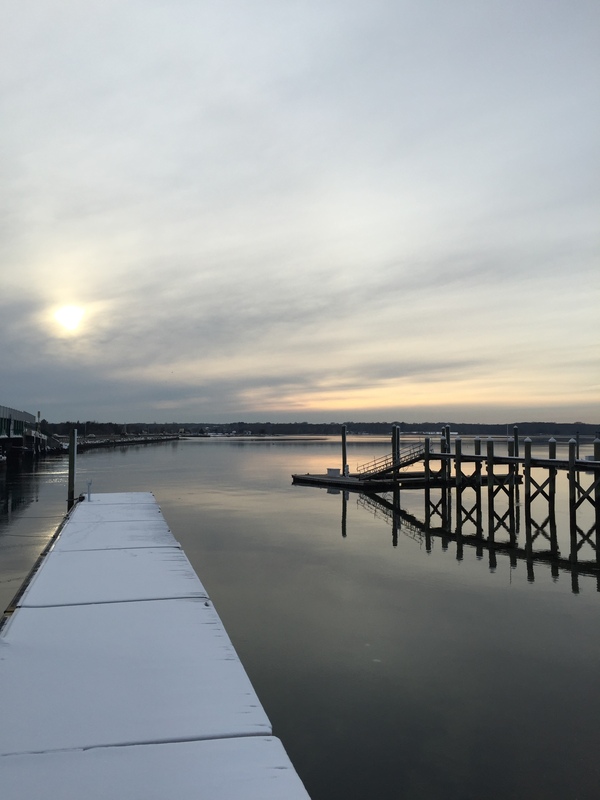 As luck would have it, on Monday morning, Boston got approximately 4-5 inches of snow. This caused even more confusion for the already confused, non-city-dwelling pugs on their individual trips outside. That’s right…individual trips outside. I had to carry each of them separately down the stairs outside to do their business (4-5 times a day) because neither of them could make it up (or down) on their own. Silver lining: I met my goal of 10,000 steps almost every day that week. Here’s a fun fact: pugs are often called Velcro dogs. Why? Because they never. ever. leave your side. And these two buggers are certainly no exception. 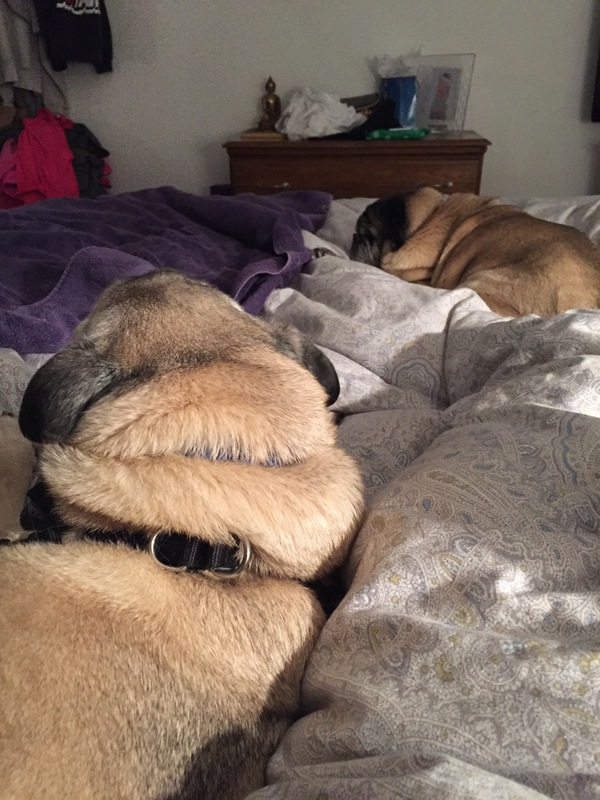 When they chose a spot to lay down next to me, it was done in a methodical way so that they would know if I decided to take a call/send a text/sneeze/move/breathe. You get the idea. Over the next several days I spent 24/7 with these guys. They would not let me out of their sight. Their entire world, everything they knew, had been turned upside down and I was the only thing that was still familiar to them. It was quite pitiful and my heart broke for them. I knew my dad would be back to pick them up on Saturday morning…but they didn’t. And there was no way I could explain it to them. So together the three of us made the most of it…spending the majority of our nights doing what pugs do best: snuggling. 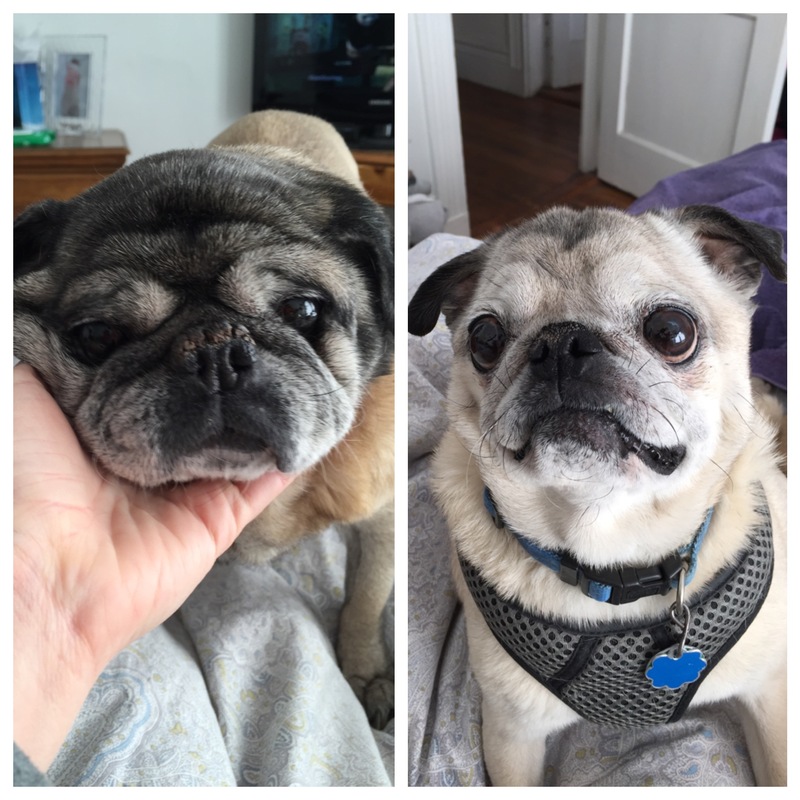 Despite some accidents (read: multiple poops in the kitchen), a couple of 2am wake-ups so they could have a drink of water and a coating of pug hairs on the surface of everything throughout my entire apartment, I was sad to see them go. For those seven days, having two living, breathing creatures that were completely dependent on me, gave me purpose and responsibility. I am not in any rush to get one of my own, but I would definitely take them again for the week. Their snuggles helped heal my heart and those two little balls of fur totally helped pull me out of the funk I was in. Well…I’m sure the wine helped too. Wow. So it’s February. Yikes. That went quick. Gosh, I took a bit of a hiatus there for the month of January! I now understand why, when one takes a blog class, the teacher recommends not sharing your site with anyone until you have at least three months of content! 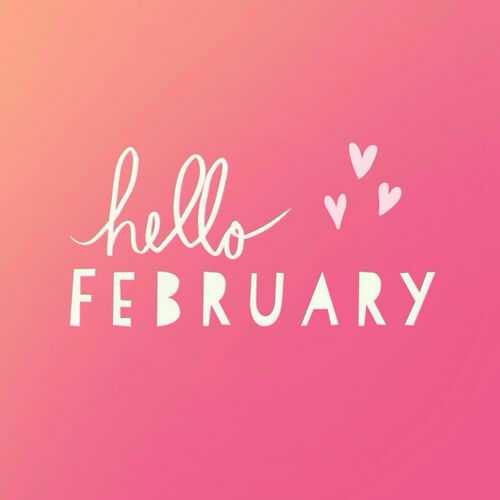 In full disclosure, my heart took a bit of a beating over Christmas…and New Year’s…and actually well into January. I just didn’t feel up to writing or toying around with this site…or doing anything that didn’t involve work, sleep or Bravo! 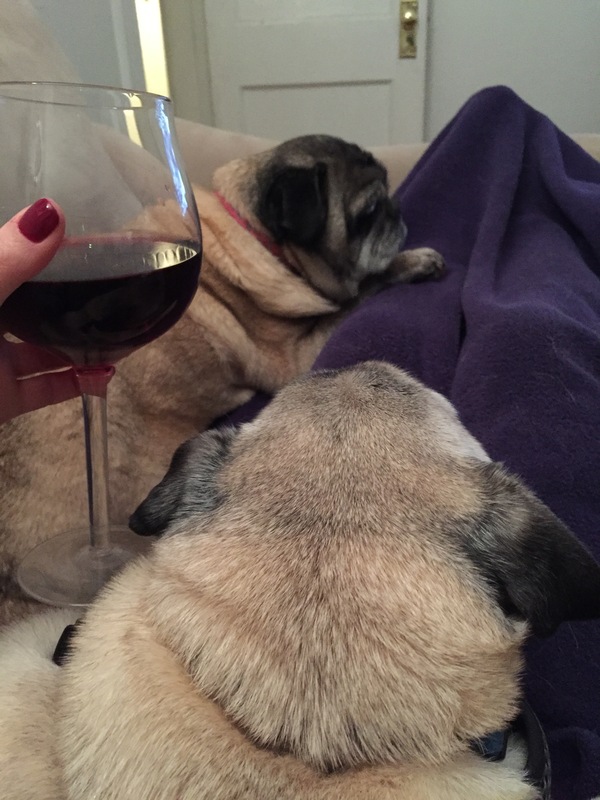 However, after several days (and nights) in bed, way too much reality television, a week of babysitting (er, dog sitting) the two most endearing geriatric pugs and lots of support, love and advice from all my friends, I’m ready to get back at this. A couple weeks ago, I signed up for a class on WordPress at the Boston Center for Adult Education. That probably sounds really dorky, and it kind of is. But, since I’m known to my close friends as a bit of a ‘mathlete’, it seemed appropriate to get a little formal education on the program – um, and the class was half off…no brainer. All kidding aside, I do feel as though I’m finally getting the hang of navigating and designing this site and it’s starting to come together and have the look in envisioned. And I quite frankly, I’m loving it!